Following the pattern of strictly party-line votes on two previous nominees—Attorney General-designate Sen. Jeff Sessions and Betsy DeVos for education secretary—the former congressman from Georgia was approved on a 52-47 vote. “(Price) can now get to work and focus on the task of replacing the failed Obamacare with sustainable, free-market principles,” Sen. Johnny Isakson (R-Ga.) said in a statement. Patient advocacy groups have been concerned about the former legislator's efforts to repeal the ACA. “With this vote, Senate Republicans have placed the fate of the nation's healthcare system in the hands of a man whose stated goal is to dismantle its very pillars and leave millions of people to the mercies of the insurance industry,” Ron Pollack, executive director of Families USA, said in a statement. “Decisive action from HHS may be the only thing that can prevent a death spiral in the individual market, and even then, uncertainty about repeal, replace or repair may be too much for HHS to overcome,” said Morgan Tilleman, an attorney with Foley & Lardner in its heath insurance practice. As HHS secretary Dr. Tom Price may be torn between orders to repeal the ACA and pressure from insurers to stabilize the marketplace in order to maintain coverage for 20 million people. Price will look for Obama administration regulations that healthcare industry groups have deemed too burdensome and seek to alter or eliminate those, said Dan Mendelson, president of consultancy Avalere. Price's 2015 legislation to repeal the ACA would have granted physician groups considerable control in key areas of healthcare quality. Those provisions raised conflict-of-interest concerns among some critics. Price's ties to the healthcare industry overshadowed his confirmation process as did calls from Democrats for investigations into his stock deals. Several reports alleged Price had personally benefited from legislation he introduced that ended up influencing the price of healthcare stock he had purchased. Through it all, many physicians' groups stood by Price. Under Price, HHS will begin reviewing Medicaid waiver requests from Arizona, Indiana, Texas and other GOP-led states seeking approval for conservative policies that were rejected by the Obama administration, Mendelson said. These states want to impose work-search requirements as a condition for Medicaid eligibility, lock people out of coverage for nonpayment of premiums, and set time limits on how long people can receive benefits. It's expected that Price will look favorably upon such requests, which are strongly opposed by patient advocacy groups who believe they will affect access to care for some vulnerable communities. Price is also expected to spearhead the conservative drive in Congress to restructure Medicaid and Medicare, as he previously tried to do as a legislator. Republican lawmakers in Texas, Wisconsin and Price's home state of Georgia want to work with congressional Republicans on proposals to convert Medicaid into a program of federal block grants or per capita grants, giving states much greater flexibility in how they use federal Medicaid dollars. At the same time, however, states likely would receive significantly less money over time. 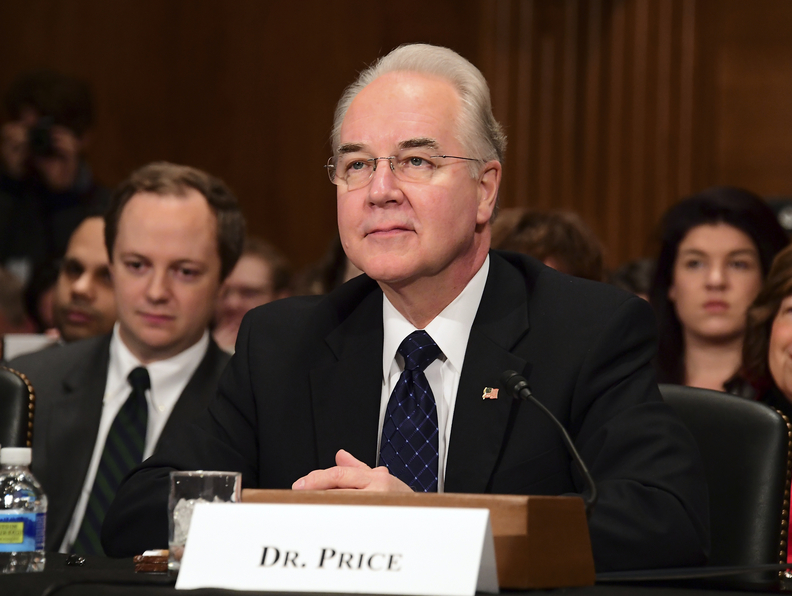 Price will have a key partner in considering Medicaid waivers if and when the Senate confirms Trump's nominee for CMS administrator, Seema Verma. She has helped such states as Indiana develop conservative Medicaid expansion models. Senate Finance Committee Orrin Hatch has scheduled an initial confirmation hearing for Feb. 16. In addition, Price may look for ways to expand the role of private health plans in Medicare, which would be consistent with his support for converting Medicare into a defined-contribution, “premium support” program. He likely will work closely with House Speaker Paul Ryan (R-Wis.) on a proposal to restructure Medicare along those lines and increase the eligibility age to 67, though Senate Republicans remain leery about making big changes in the politically popular senior health program. “Congressman Price is ... a proponent of radical and dangerous proposals to cut billions from Medicare, converting it to a voucher program which would lose value over time and will lead to less parity in coverage and increase the financial burden of healthcare for low-income groups,” the NAACP said in a letter. Former congressional colleagues who placed Price in his new role, however, disagree. “He will play a leading role in our efforts to repeal the failed healthcare law and provide the American people with more affordable, patient-centered care,” Rep. Virginia Foxx (R-N.C.), chairwoman of the House Committee on Education and the Workforce, said in a statement.